A good friend & I spent about 6.5 hours on Sunday blending essential oils, mixing up foaming soap, hair treatment, shower gel, moisturizing body butter & a number of specific essential oil roll-on blends. I had so much fun!! One of the blends is a bruise blend I really like. 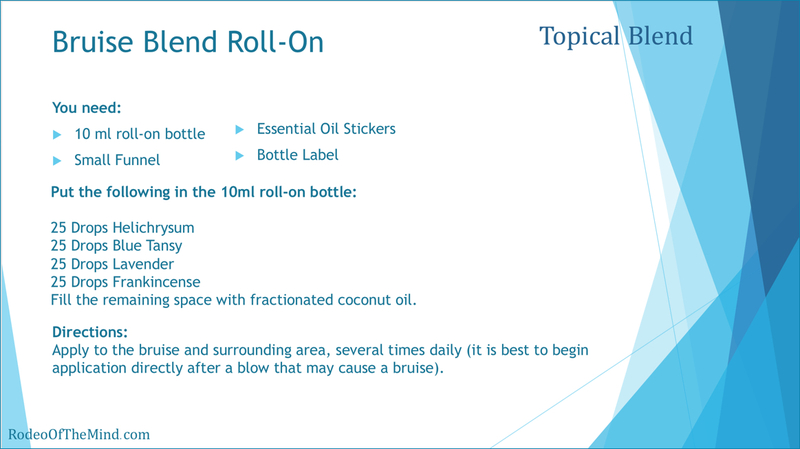 I have found that using this blend on bruises (even on some of my really painful bruises) reduced the pain significantly in about 10 minutes. In my experience, I noticed that the black and blue of the bruise lightened up and swelling went down. Precautions: 1) Can be irritating if used in excess or not diluted properly. 2) If pregnant, check with your doctor prior to use. Precautions: 1) Don’t use if you have low blood pressure. 2) Moderate and low dilution is okay for kids. 3) Use only with doctor’s OK when pregnant. Precautions: 1) Can cause skin irritation. Skin test on a small area. Dilute with carrier oil if needed. I thought I’d share the bruise blend with you.